For the past few weeks, those unfamiliar with David Milch's style have probably been scratching their heads, wondering what, aside from the lush visual rubric established by Michael Mann, critics and fans see in Luck. As far as Milch shows go, Luck's characters, at least initially, are a good deal less likeable than, for instance, Dennis Franz's alcoholic, racist Andy Sipowicz was in Milch's NYPD Blue. Because the writer incorporates horse-racing terminology into his trademark stylized slang, Milch-speak as it's referred to, is made more impenetrable in Luck than it is in his period-accurate Deadwood—never mind the surfer-infused dialect of his failed John in Cincinnati. Tonight's revelatory episode, written by Daily Racing Form columnist Jay Hovdey and directed by Phillip Noyce, marks the turning point that should put any detractors' criticisms to rest. Re: Classical Music at race climax - Max Richter, "The Blue NOtebooks". "Luck" currently has the best cast on any television show playing today. Hoffman, Nolte, Ortiz, Gambon, Farina, Allen, and Richard Kind have all been very strong on the show so far. After four episodes, the show really feels like it has found its groove or has at least established a rhythm and structure that will hopefully keep viewers hooked on its first rate writing and acting. Lastly, something about the show feels very mature in terms of subject matter. I'm not sure if it's the world weariness that Hoffman and Nolte seem to so effortlessly bring to their characters or the fact that this is a show populated by adult characters with real-world, adult problems, but something about the show just feels very mature and grown up in a good and believable way. 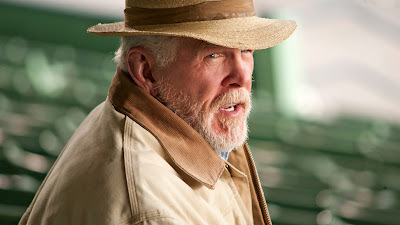 Even after just four episodes, I think "Luck" is wiser and more thoughtful than "Treme", "Boardwalk Empire", and "Game of Thrones" combined. Thanks, Anonymous. I had already received this tip from another reader and updated the post accordingly. Aden, while I agree with you for the most part, I'm still wary of going all in and calling it the very best show on TV. I like TREME a whole lot better because it weaves a bigger tapestry. But this is no knock on LUCK which I think has great potential. Hoffman and Nolte are great, and Farina has always been a personal favorite of mine. I hope he gets to do more next season. There's only a few scenes he gets to himself in the rest of LUCK's first season.